Mon. 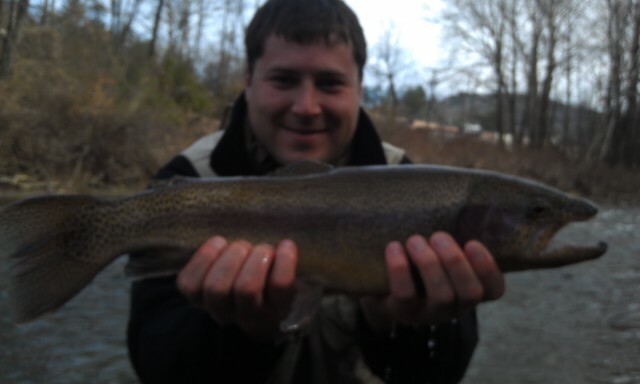 Dec. 31, 2012….Good morning with ice in the guides, guiding JT Pope of Raleigh, NC , and we have had a good day nymphing, landed 15-20 fish so far including a citation rainbow. Fished several spots, the water is in great shape and plenty or good flow now with all the melting snow and ice. 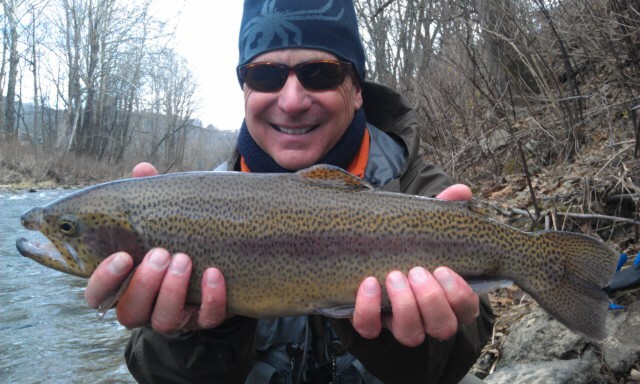 Will have a fresh report from the river……Happy New Years Eve…! Great Day Fishing in the Snow…. 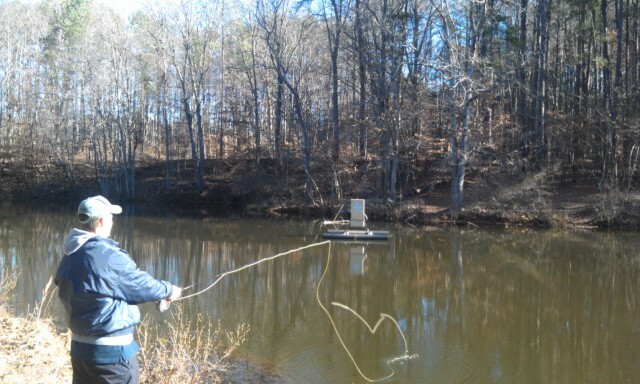 Fri…Dec.28, 2012…What a nice day to fish, my kind of day. Spent the last couple days since Christmas with the flu bug so it was good to get out. I guided Gregg Williamson, Oak Ridge, NC, and his brother Ken who was here visiting from San Diego, CA. It was great to have Ken out again, had not fished with him since our 2008 Wyoming trip. We arrived to 163cfs flow at Dunlap Creek on the private section at Escatawba Farms . With a good bit of snow laying around it made it really seem like a day of winter fishing. We started by nymph fishing with double rigs and simply put it was fantastic. The first spot Ken and Gregg went back and forth for a couple hrs , fish for fish. We got maybe one 20" rainbow, then moved down to another slow stretch. We did pretty well there too, scoring several more nice fish. With toes cold, we headed back up the hill from the creek to have lunch by a bonfire. After warming up and enjoying some food, we went downstream to another long stretch and did well there too, both Ken and Gregg landed a bunch of fish. Gregg caught the largest one here, a 20/20…..that is a 22-23" beast of a rainbow that ate one of my #22 glass head zebra midges. A 20 inch plus fish on such a tiny fly is quite a feat. We hit one last spot as light was fading and Ken caught 8 more nice fish and we broke off a 20" in plus brown …… it was a phenomenal finish to an already good day. 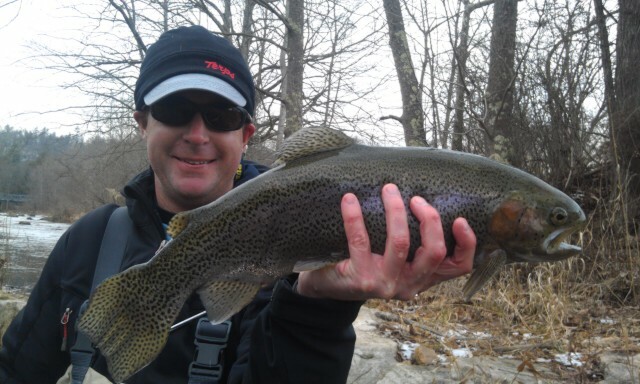 My guess is we landed about 45-50 fish on the day….in 35-37F water. And they say fish don’t feed as much when its under 40F water temp. Really? Great day…. Looks like Winter Weather Advisories for most of NW NC Mtns and SW VA , mix of snow, sleet, ice….2-4" accumulation through tomorrow afternoon. Hey, its winter…..sounds like great fishing weather…! 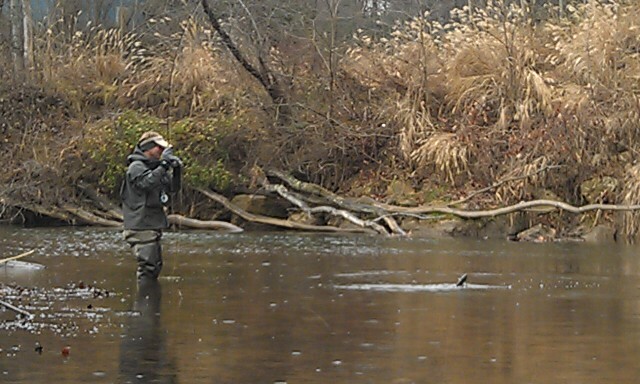 Will be gearing up for my next guided trip on Monday 12/31, which will round out 2012. Will be guiding JT Pope of Durham, NC, and looking forward to finishing the year strong. Have a great evening…..if traveling tonight or tomorrow in the High Country be safe…! Sat. Dec. 22, 2012….Brrrr is the word, its cold. And I love it. Feels line Winter…..Finally! Great way to officially usher in the first day of winter. The mountains got a good shot of rain, cold, and snow….and fishing will be good in the coming week. Water levels much improved. Did an on the water lesson with Todd and Alex Baker and it was fun, and not that bad in terms of cold temps. We found a place to get out of the wind and its actually now turned out to be a pretty nice day. Christmas rush is on…..hope you have a great Saturday. We are available and open for Gift Certificates, Stocking Stuffers, Flies, right on up to 3pm on 12/24. So if you have a need or thought it was too late to get something its not. We can deliver as well, and also do E Gift certificates as well that are easy, quick, and make a great gift for trips, lessons, etc. Also, we are set up to do mobile transactions and can do business from anywhere or by phone too. Merry Christmas to You and your Family…..
Thurs. 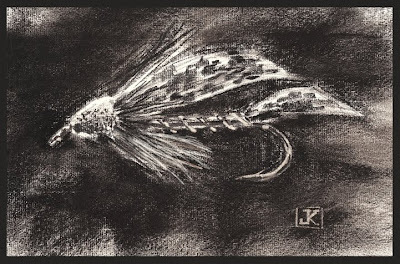 Dec. 20, 2012…..This ones a play on words , not "crappie" as in fish but as in foul weather. I guided Dr Tom Wolff and Jeff Davis and I picked my guys up in Newland, NC, and we were off to the river. It was in the low 30s and windy and the forecast was for rain to snow and Winter Weather Advisory….. Uh oh. We had been watching this one all week, and this weather system grew into a powerful one in short order. We nymph fished primarily and while we didn’t kill them we still ended up with a good day in albeit horrendous conditions. 35-40 fish on a variety of nymphs , double rigs fished with a lot of weight as the river level has come up a lot. We hit a second stretch of river and did very well, catching most of our fish there. It was like the more nasty and foul the weather got the better the fishing was. We scored a ton of fish in the last hour and a half including two citation fish, one 21" rainbow by Tom and a citation brookie by Jeff. A good end to a nasty weather day. Getting ready to head down the hill in time to get back in and put together some Christmas orders. Making it out just in time before the roads get bad. There is now a Winter Storm Watch for the NC Mtns with 3-5" of snow and 40-60mph winds. Yes….! Winter is here. Thurs. 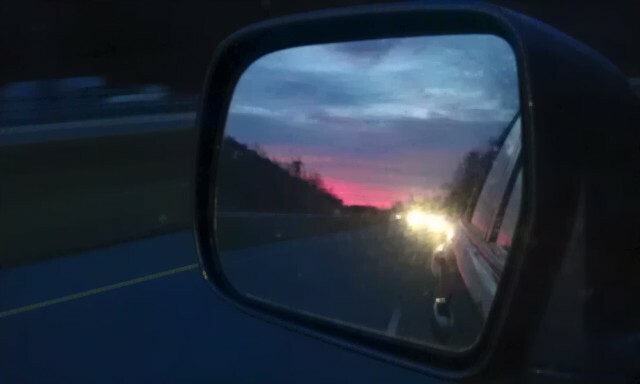 Dec. 20, 2012…….. That’s the scene from the front range of the Blue Ridge in Wilkesboro, NC. As the saying goes the radar seems to confirm…..we have some wet and bad weather coming. But I’m not complaining as we need the rain. Guiding Dr Tom Wolff and Jeff Davis today and it looks like we will get dry casting conditions for the first hour or two, but after that hang it up….or us up. To dry. We will be doing some deep nymphing and could still be a good day. More to come from the river…..
Tues. Dec. 18, 2012….. Just up after quite a winter’s nap……too many (what, too many? nonsense) days on the water, lots of fish, huge fish, Bojangles steak biscuits, McDonald’s Holiday Peppermint Mocha and McFlurry, egg nog…a warm crackling fire….Jeff crashed and burned fireside last night after a truly great day and time with Brian Fitzgerald, Rick Trautman, and Greg Adzima. 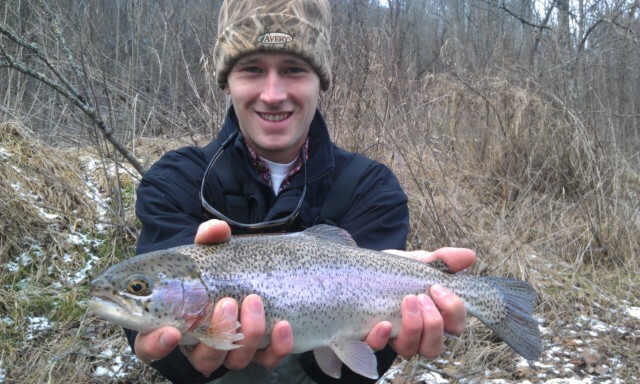 Fun, fellowship, fish…..lots of fish…..and a mega beast of a rainbow. We had a great day…..this is from yesterday’s fishing and the fishing report on it….Let me tell you the story…. It was a good near-end to the 2012 season and to Escatawba, and ushering in the 2013 fishing season. Winter fishing is here, and yesterday was a good Kick Off to it. One client landed the largest fish I’ve ever had someone catch at Escatawba and definitely the fish of 2012, unless someone in the next week and a half breaks this mark……I guess it could happen. Its been a great year. But we had a pretty good day, The day started off mild and rainy, but then became cold and rainy and windy. Sun in, sun out, partly cloudy, then sunny, then mostly cloudy, then a heavy shower, then drizzle, it was all over the place. Definitely weather in flux. But it didn’t hurt the fishing, they had the feed bags on. We didn’t kill them the way you normally think, but one here , two there, five in a row…..before the end of the day we’ d caught a ton of fish and missed at least as many more and broke off a bunch. But then again, when you fish a river full of large fish that’s a normal story. Here’s how the day went….. I Guided Greg Adzima, Brian Fitzgerald, and Rick Trautman and we had a good day. Landed probably 50-60 fish or more and several real beasts. If we’d caught or landed every fish that hit, that we had on briefly, that broke off or came off……it would have been that many fish per person. Had the whole place to ourselves. The day had settled into a nice, easy rhythm, us standing there catching fish, talking back and forth the way guys on a fishing trip in paradise do. Then it happened. 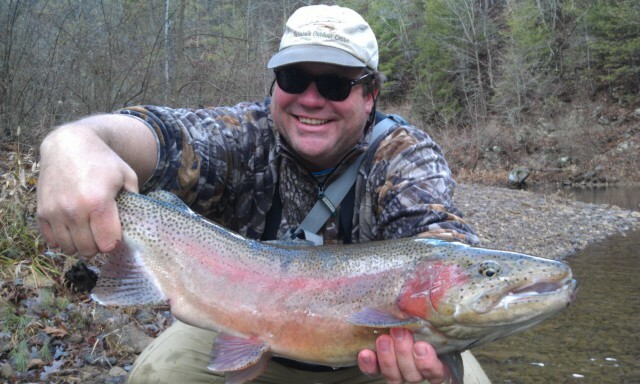 Greg Adzima and I were at the head of one of the largest pools on the upper river when we spotted a ginormous rainbow. We made several presentations to the fish, and actually got it to take several times, but missed the hookset. Eventually the fish left its station and cruised by us, desires unfulfilled, and cruised downstream to the lower end of the pool and was briefly out of sight. I mentioned to Greg, lets re-rig, show him something different , and give him a chance to forget and come back. I could see how the fish was acting and have seen it all before….this guy was going to eat and wasn’t going to be denied the opportunity, whether we were there participating or not. I chose a fly I knew had been working on these situations lately, and with the dark conditions the Y2K that I chose has been a killer lately. I tied it on, made a few last minute recommendations on where to present the fly, what to look for as far as when the fish moved on it, and it went like this…. I pointed out the cast to Greg, he made a good throw and the fish slid right just as I expected and gently sipped the fly….this time Greg’s strike was solid and smooth and timed perfectly, just as I’d instructed….and the battle was on. About 5 minutes later about 28-30 inches and well over 10lbs of hook jawed rainbow trout lay in my net. Unreal, the largest to date in this river in almost 13 yrs of fishing Escatawba….dating all the way back to its beginning back in 1999/2000. Even eclipsed the great 10lb plus brown trout in the Old Man hole landed on a November trip back in 2007. This fish is officially the largest fish of the year for my clients. We were shaken up pretty good….and it was awesome. Rick helped us , we snapped a few quick photos, revived the glorious beast, and then it was off to carry on. The fish was landed on our new JWFF /Stone Creek fluorocarbon tippet material in 5X……pretty good job of handing the big fish, 4.0 pound test material and this fish was between 10 and 12 lbs. We fished our way downriver, and caught a bunch more fish in just about every spot that we fished. We quit about 5:25pm as it was getting dark and headed back to emerge from our waders. We had a great day nymph fishing, but we could have done well on dries as well, as there were both blue winged olives and little black stoneflies coming off. And fish were rising everywhere. But when something is working, and you are catching the giants……its hard to change. Check out all the photos in the Entire Trip Photo Album here . The Farm is fishing well and today kicked off our winter season there and we will be doing trips all winter long at Escatawba plus another group trip in January….let’s go fishing and enjoy some of the finest winter fishing you will experience anywhere. Again, let me repeat…..we do one person, two person , three people, groups……plus our own scheduled group trips to this water /Escatawba/Dunlap Creek all winter long. It fishes well no matter what the weather is doing, unless of course the water freezes…….which is rare, unless we get a two or three week stint of night time temps in the teens and twenties……. So it will be a great fishing option all winter long. This trip is $250 one angler, $450 for 2, $600 for three….Let’s Go Fishing! We get a lot of questions and inquiries about Gifts, Gift Certificates this time of year. We are able to provide whatever you might need in the way of Gift Certificates for Trips, Lessons, Schools, you name it. Any Service we offer. We also have some great flies, fly assortments, fly fishing gadgets and doo dads that make great gifts by themselves or as stocking stuffers. We are offering more and more of this stuff and do so all year round and not just Christmas. Here are a few links to some of our new items…..for Christmas 2012 and 2013…..
Time short and run out of ideas or just out of time….? For local Customers I can offer the option of putting on my Santa hat and hand delivering your gift or special gift for the fly angler in your life right to your door or by appt and redenzvous at an agreed upon location…this I have done for many years at Christmas….its not a bother, its a privilege and one of the treats I look forward to each and every Christmas. Right now I am available to deliver on 12/21, 12/22, 12/23, and 12/24 up to 3pm. We can accept cash, checks, and all debit and credit cards and are able to do mobile transactions from anywhere. 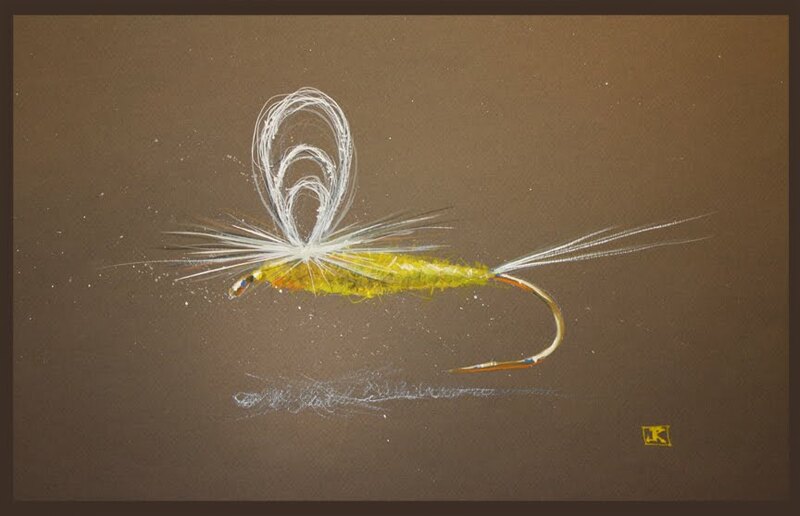 So if there’s a need, just pick up the phone and call at 336-944-3628 or send me an email at jwflyfishing@gmail.com . Well, enough of this typing thing…..there are songs to be sung while sipping some great coffee while hearing a crackling fire and tying up the next batch of flies. Need some good elves…..
Will be guiding a trip for two longtime friends/clients Jeff Davis of Lexington, NC, and Dr. Tom Wolff of Winston-Salem, NC. We will be fishing a NC stream in the morning and then heading over to the South Holston to fish what we hope is some blue winged olives and sulphurs hatching…….hard to believe we have world class fishing all year……this time of year….right in our own backyard. We are mightly blessed…..
Good Day with Our Escatawba Winter Kick Off Trip…. Tues. Dec. 18, 2012…..The day started off mild and rainy, but then became cold and rainy and windy. Guided Greg Adzima, Brian Fitzgerald, and Rick Trautman and we had a good day. Landed probably 50-60 fish or more and several real beasts. 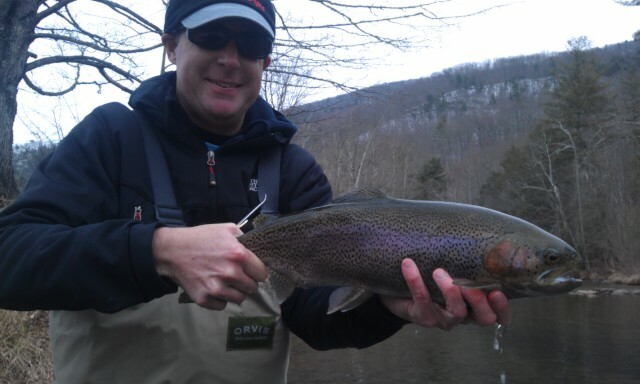 Greg Adzima and I were at the head of one of the largest pools on the upper river when we spotted a ginormous rainbow. I pointed out the cast to Greg, he made a good throw and the fish slid right just as we expected and gently sipped the fly….and the battle was on. About 5 minutes later about 28-30 inches and over 10lbs of hook jawed rainbow trout lay in my net. Unreal, the largest to date in almost 13 yrs of fishing Escatawba….dating all the way back to its beginning back in 1999/2000. This fish is officially the largest fish of the year for one of my clients. We were shaken up pretty good….and it was awesome. The Farm is fishing well and today kicked off our winter season there and we will be doing trips all winter long at Escatawba plus another group trip in January….let’s go fishing and enjoy some of the finest winter fishing you will experience anywhere. Have a great evening…..time to have a long winter’s nap….! Sat. Dec. 15, 2012…..We had a good day today despite some very cold temperatures that took forever to warm up. By noon it was 37F air temp and 38.5F water temp. I guided Dr. David Spivey and his son -in-law Jon McGraw, and we had a great day with about 40 plus fish on the day which included 3 large rainbows and a. Large brook char. We caught one more citation rainbow at the last place we fished along with about 10 more fish. Caught fish, had the whole river to ourselves on a sunny Saturday…….wow. Sat… Dec. 15, 2012….Great day even if it was cold to start. Guiding Dr David Spivey and his son in law Jon McGraw…landed 40 fish and 4 citation fish so far..it was freezing cold but now quite warm…..